Flexispot Deskcise all-in-one desk bikes are available in Mills, Thode and Innis Libraries. The units – part stationary bike, part desk – allow you to study and get moving all at the same time, and are said to increase both focus and productivity. These adjustable units include an attached desk space and a ride computer to track the time, distance and calories burned during each session. Need a healthy snack to keep you going? The Library is offering free apples and granola bars to students. Find them in the Learning Commons at the help desk and at the main Service Desks in Mills, Thode and Innis libraries, as well as the Lyons New Media Centre. Apples and granola bars are available on a first come, first served basis – help yourself and enjoy! Trouble focusing? There’s an app for that! Relax, learn to manage your stress, and improve your ability to focus with Muse brain-sensing headbands. Using seven sensors to detect and measure brain activity and Bluetooth to send this information to the free Muse app, the headbands provide a one-of-a-kind interactive meditating experience. Muse provides feedback on your meditation by translating your brain signals into the sights and sounds of wind, which are stormy when the mind is active and settled when the mind is calm. The app reports on your session and progress, adjusts your goals, and challenges you to remain calm for increasing lengths of time. Visit the Library Services Desk in Mills, Thode or Innis libraries to borrow the headbands for up to a week. Life in a northern latitude can be tough with a lack of sunlight. Help replenish your levels and pick up your mood with our happy lights. Mills has a SAD lamp available for circulation. There are also lots of board games and puzzles available to students, as well as sports equipment including a soccer ball, football, frisbee and skipping ropes. Just visit the service desk to sign them out. You’re all set up for an intense study session at the library, and realize that you forgot your headphones! You can still enjoy your favourite study playlist by borrowing headphones for four hours at a time from the services desk in Mills, Innis or Thode libraries with your library card. Take a break and unwind in Lyons New Media’s new “Zen Zone,” a quiet space where you can relax and de-stress during the exam period, or any time throughout the term. Help yourself to magazines, books, puzzles, word searches, crosswords, games and cards, as well as supplies for colouring, knitting and origami – all these items are available in the space. Students can also sign out and enjoy VR glasses and robots. Some items can only be used within LNMC, while others can be signed out for up to 24 hours. Click here for more information. Take a break in the Innis Library De-Stress Zone, which includes range of activities to help you decompress, including colouring materials, puzzles and word searches. Sign out a game at the desk, try out the exercise/desk bikes or sign out the energy light therapy lamp. Students who complete the Innis Library word search can submit it to our ballot box for the chance to win a prize pack! Vending machines with snacks and beverages, as well as new high-end coffee brewing machines, are now available and being stocked regularly in Mills, Innis and Thode libraries. Thode library is open 24 hours a day, seven days a week until the end of the exam period. Effective April 7. Innis Library is open Monday to Thursday: 8:30 a.m. to 1:45 a.m., Friday: 8:30 a.m. to 10:45 p.m., Saturday: 10:30 a.m. to 5:45 p.m., Sunday: 1:00 p.m. to 7:45 p.m. Effective April 8. Mills Library is open Monday to Friday 8:00 a.m. to 10:45 p.m., Saturday: 10:30 a.m. to 10:45 p.m., Sunday: 12:00 p.m. to 10:45 p.m. Effective April 8. The Mills Learning Commons is open 24 hours a day, seven days a week until the end of the exam period. Effective March 31. McMaster Libraries have countless resources to help students at any time of year, but during the exam period when stress levels soar, and students are studying feverishly, Mills, Innis and Thode libraries have lots of services and stress-busters that can help make this hectic time a bit easier: <strong>Pedal your way to productivity</strong> <a href="https://flexispot.com/all-in-one-desk-bike/">Flexispot Deskcise </a>all-in-one desk bikes are available in Mills, Thode and Innis Libraries. The units – part stationary bike, part desk – allow you to study and get moving all at the same time, and are said to increase both focus and productivity. These adjustable units include an attached desk space and a ride computer to track the time, distance and calories burned during each session. Deskcise all-in-one desk bikes are just one of the many resources and stress-busters available at Mills, Innis and Thode libraries to help students get exam-ready. <strong>How do like them apples?</strong> Need a healthy snack to keep you going? The Library is offering free apples and granola bars to students. Find them in the Learning Commons at the help desk and at the main Service Desks in Mills, Thode and Innis libraries, as well as the Lyons New Media Centre. Apples and granola bars are available on a first come, first served basis – help yourself and enjoy! <strong>Trouble focusing? There’s an app for that!</strong> Relax, learn to manage your stress, and improve your ability to focus with <a href="http://www.choosemuse.com/">Muse brain-sensing headbands</a>. Using seven sensors to detect and measure brain activity and Bluetooth to send this information to the free Muse app, the headbands provide a one-of-a-kind interactive meditating experience. Muse provides feedback on your meditation by translating your brain signals into the sights and sounds of wind, which are stormy when the mind is active and settled when the mind is calm. The app reports on your session and progress, adjusts your goals, and challenges you to remain calm for increasing lengths of time. Visit the Library Services Desk in Mills, Thode or Innis libraries to borrow the headbands for up to a week. <strong>Recharge at Mills Library</strong> Life in a northern latitude can be tough with a lack of sunlight. Help replenish your levels and pick up your mood with our happy lights. Mills has a SAD lamp available for circulation. There are also lots of board games and puzzles available to students, as well as sports equipment including a soccer ball, football, frisbee and skipping ropes. Just visit the service desk to sign them out. <strong>Thode Library Services and Stress Busters </strong> Thode Library is offering a range of activities and resources to help make exams a bit less stressful: <strong>Thode Meditation Station:</strong> get away from it all in Thode Library’s meditation room. Grab some earplugs and tune out, or borrow a Muse headband and calm your mind with a little help from technology. (30- to 60-minute booking, one person at a time) <ul> <li>Kick back and enjoy our roaring virtual fireplace</li> <li>An ongoing collective puzzle challenge! Take a break and help solve a puzzle together</li> <li>Board games and puzzles to borrow</li> <li>Forgot your calculator? Borrow one from the services desk</li> </ul> <strong>Forgot your headphones?</strong> You’re all set up for an intense study session at the library, and realize that you forgot your headphones! You can still enjoy your favourite study playlist by borrowing headphones for four hours at a time from the services desk in Mills, Innis or Thode libraries with your library card. <strong>Visit the Zen Zone at Lyons New Media Centre </strong> Take a break and unwind in Lyons New Media’s new “Zen Zone,” a quiet space where you can relax and de-stress during the exam period, or any time throughout the term. Help yourself to magazines, books, puzzles, word searches, crosswords, games and cards, as well as supplies for colouring, knitting and origami – all these items are available in the space. Students can also sign out and enjoy VR glasses and robots. Some items can only be used within LNMC, while others can be signed out for up to 24 hours. Click <a href="https://library.mcmaster.ca/lyons/tinker-equipment">here</a> for more information. <strong>De-stress and win prizes at Innis Library</strong> Take a break in the Innis Library De-Stress Zone, which includes range of activities to help you decompress, including colouring materials, puzzles and word searches. Sign out a game at the desk, try out the exercise/desk bikes or sign out the energy light therapy lamp. Students who complete the Innis Library word search can submit it to our ballot box for the chance to win a prize pack! <strong>Food or drink, anyone?</strong> Vending machines with snacks and beverages, as well as new high-end coffee brewing machines, are now available and being stocked regularly in Mills, Innis and Thode libraries. <strong>Ssshh! !</strong> If you need a quiet study space, head to the following spaces: <ul> <li>The Connections Centre in Mills, 1st floor (silent study throughout the exam period)</li> <li>6th floor of Mills Library</li> <li>All areas on 3rd and 4th floors of Mills Library</li> <li>Silent late-night study in Innis Library, Mon-Thurs, 10:00 p.m. – 1:45 a.m. 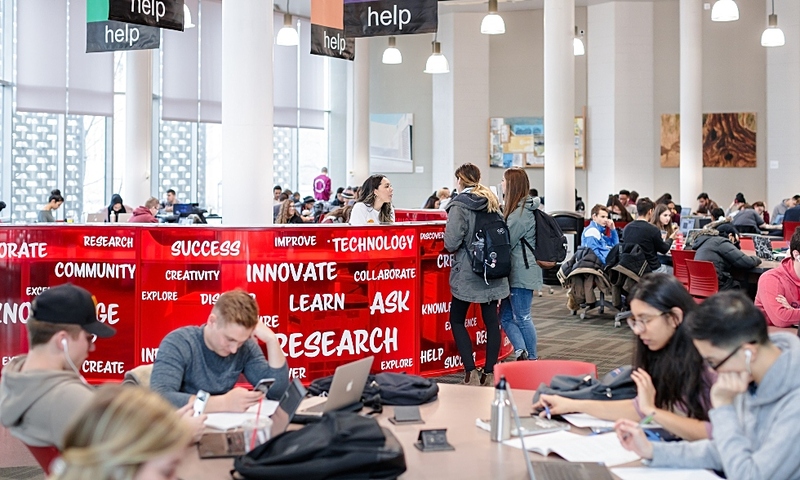 Effective April 8</li> <li>Lower level of Thode Library</li> </ul> <strong>LIBRARY HOURS FOR THE EXAM PERIOD ARE AS FOLLOWS:</strong> <strong>Thode library </strong>is open 24 hours a day, seven days a week until the end of the exam period. Effective April 7. <strong>Innis Library </strong>is open Monday to Thursday: 8:30 a.m. to 1:45 a.m., Friday: 8:30 a.m. to 10:45 p.m., Saturday: 10:30 a.m. to 5:45 p.m., Sunday: 1:00 p.m. to 7:45 p.m. Effective April 8. <strong>Mills Library </strong>is open Monday to Friday 8:00 a.m. to 10:45 p.m., Saturday: 10:30 a.m. to 10:45 p.m., Sunday: 12:00 p.m. to 10:45 p.m. Effective April 8. <strong>The Mills Learning Commons </strong>is open 24 hours a day, seven days a week until the end of the exam period. Effective March 31.